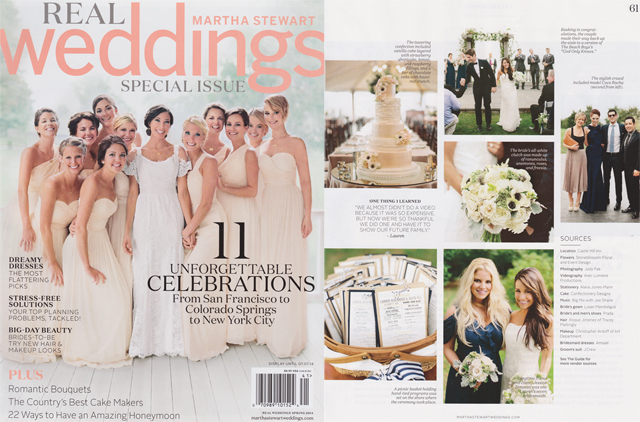 Today I was beyond excited to find some of my stationery work in the 2014 Special Issue of Martha Stewart Weddings. 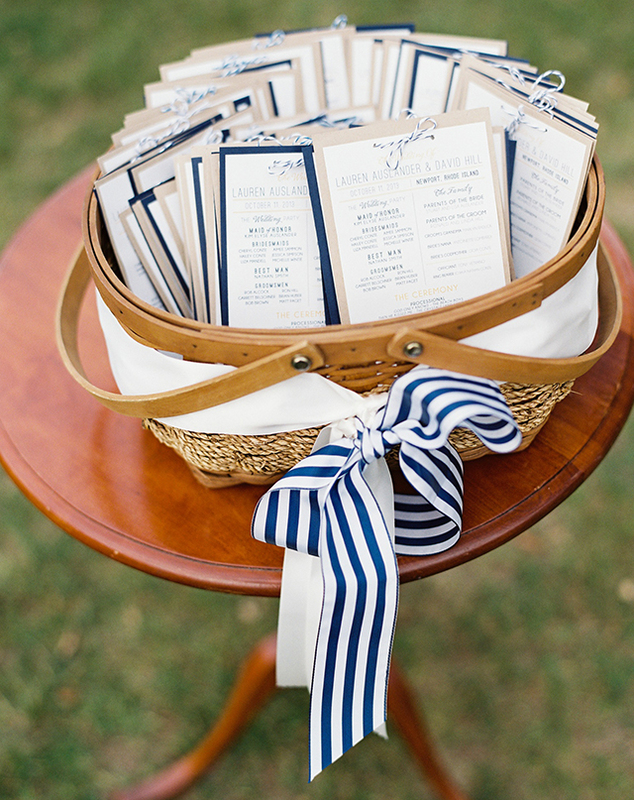 You may remember me sharing some work I did for Save The Dates HERE or the Newport-inspired bridal shower decor I put together for the same bride HERE. 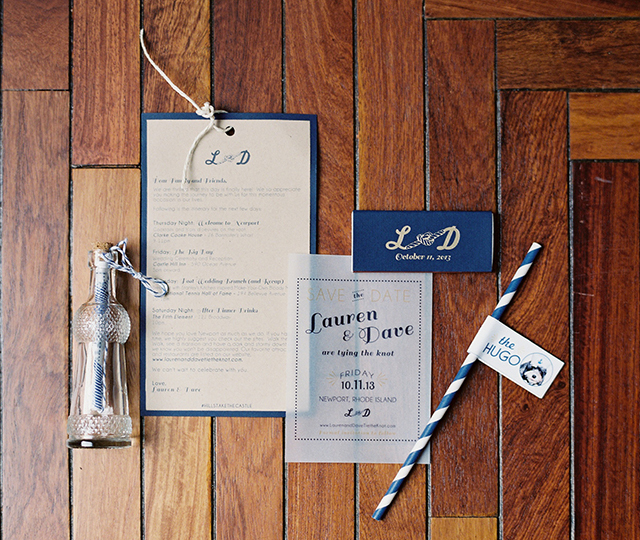 Well, those were just two of the projects I had the pleasure of working on with Lauren and Dave, my favorite wedding clients of last year. I am so happy that some of the stationery was included in the spread – and now that the magazine is out, I get to share it all with you! 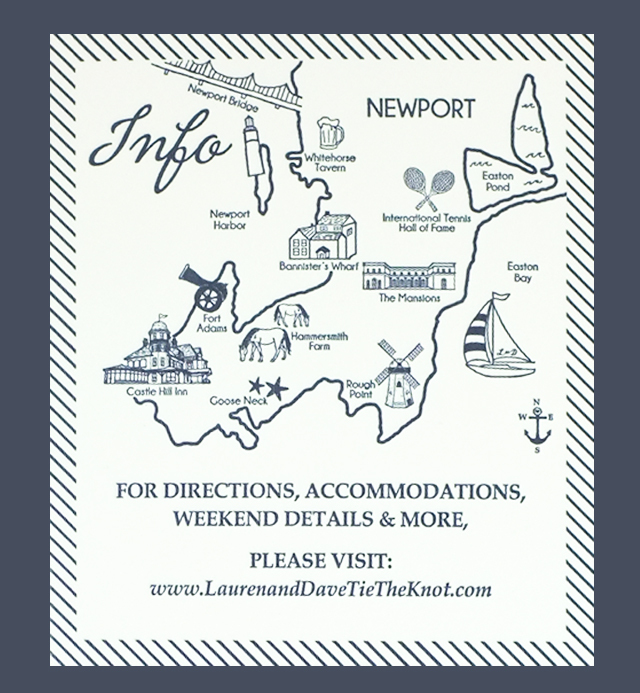 The Save the Dates: The first design I created for the couple was a custom logo that was inspired by their Newport wedding venue. You can see the full Save the Date in a previous post HERE. 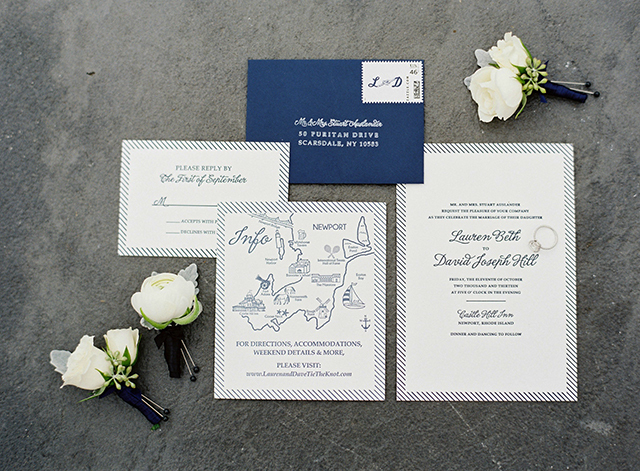 The Invites: Lauren had a clear idea of what she wanted the main invite to look like, so I followed her lead with that design and created a matching RSVP card, as well as a custom map illustration that highlighted the couple’s favorite Newport locations. Lucky for me, there is a great letterpress studio down the street from my apartment – The Arm – where I letterpressed each of the three pieces by hand. For the envelope I designed a custom liner and used a mix of vintage and modern Rhode Island stamps for the postage. 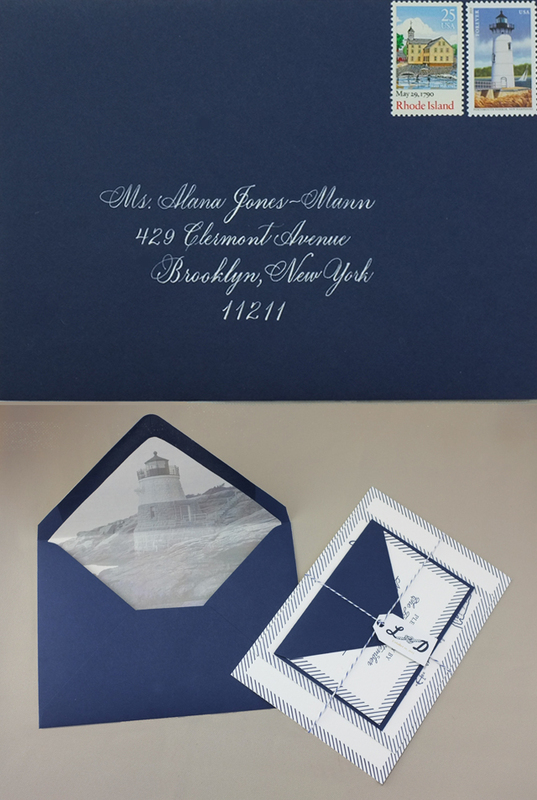 I worked with Anne Kennedy, a super talented local calligrapher, who provided the perfect calligraphy addressed envelopes for each invitee. 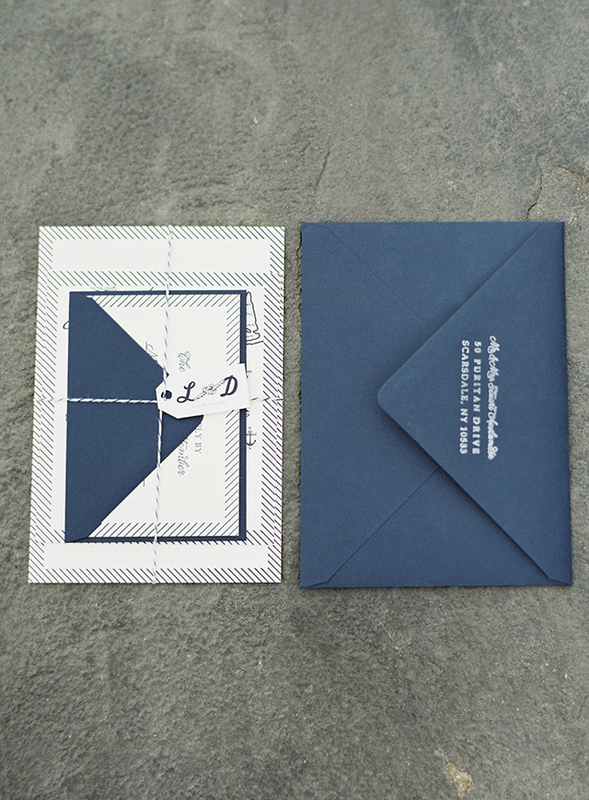 The three invite pieces and the return envelope were packaged together with blue and white baker’s twine and tied with a customized tag. 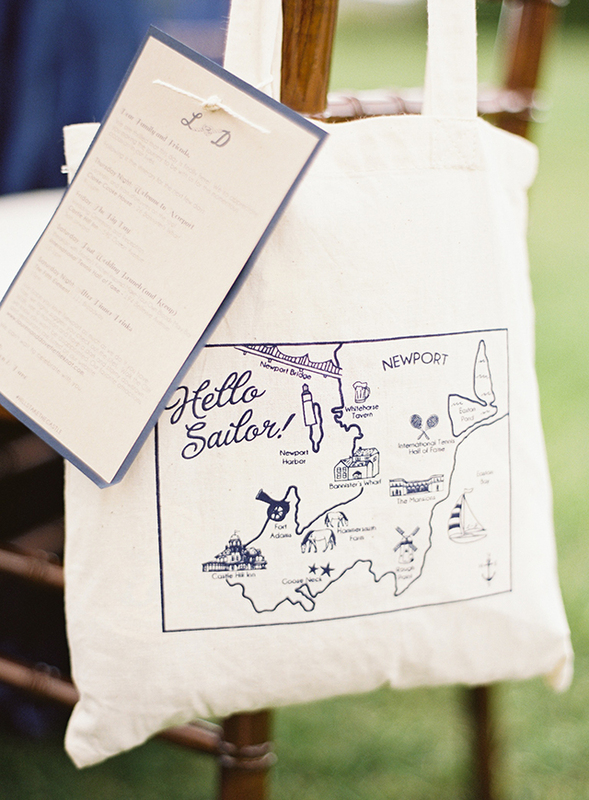 The Welcome: Tote bags were printed with the map I initially illustrated for the invite. 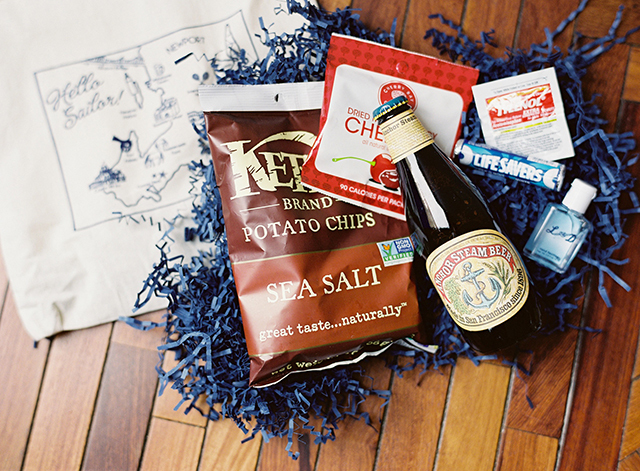 The welcome bags included a selection of goodies and a note which highlighted the weekend’s activities. 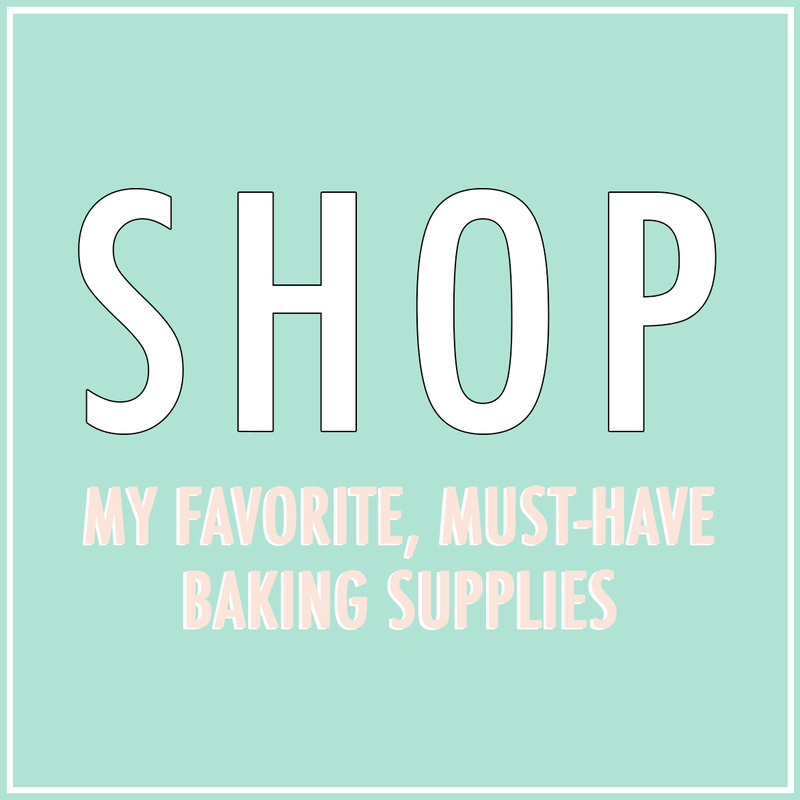 After designing the notes, I printed them on a kraft paper and glued them to a sturdier piece of navy blue card stock to give them some additional personality. 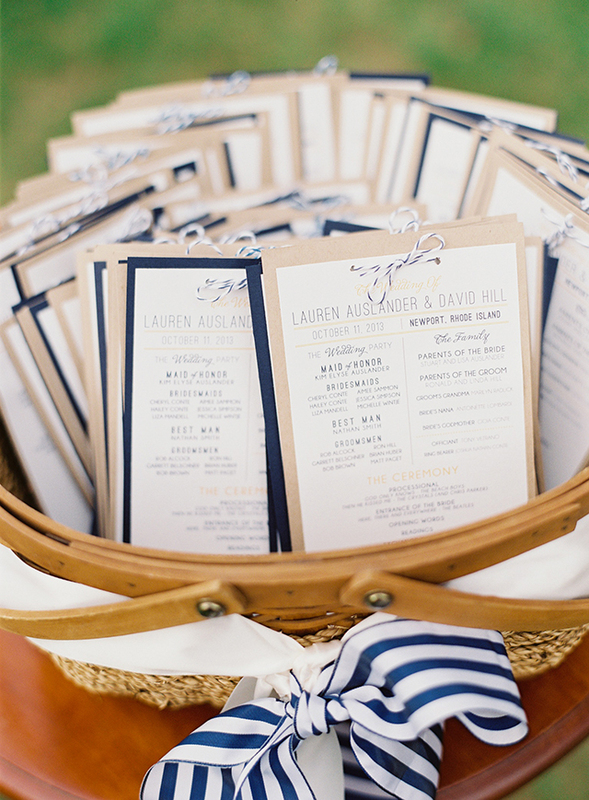 The Programs: Programs were designed and printed in a similar fashion to the welcome note. 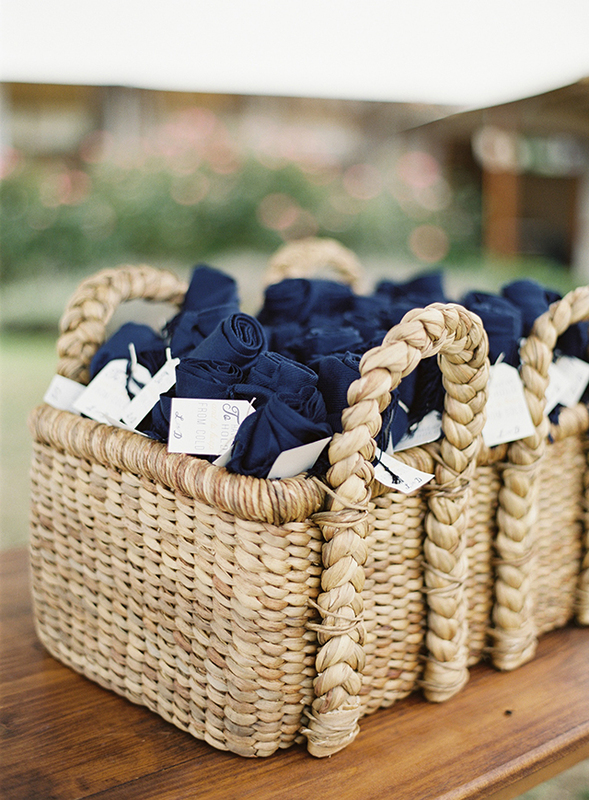 They were placed in a straw basket and placed on the shore where the ceremony took place. 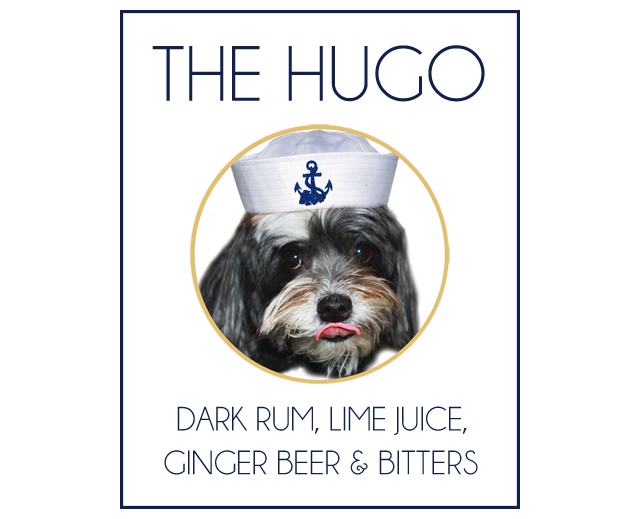 “The Hugo” Drink: Lauren and Dave have a very adorable pup named Hugo, and like many dog loving bride and grooms they wanted a way to incorporate Hugo into the wedding, despite him not being able to physically be there. 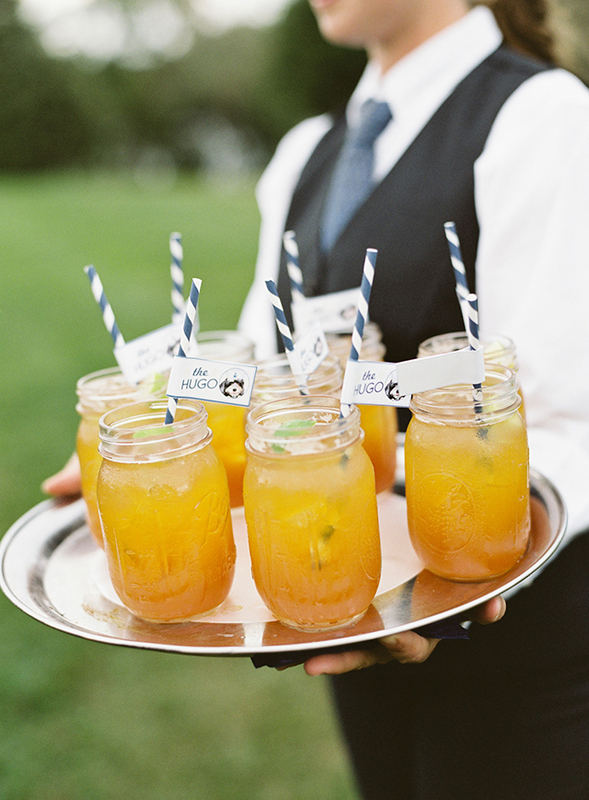 The couple created a signature drink in honor of the four-legged guy, and I designed some fun drink signs for the bar and labels for the straws. 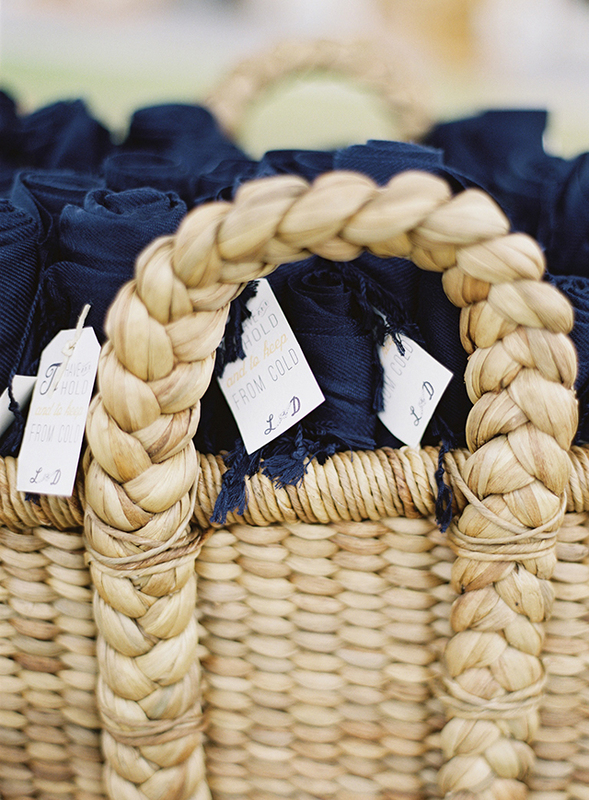 Pashmina Scarves: I created tags for the pashmina scarves that were provided for guests at the ceremony. 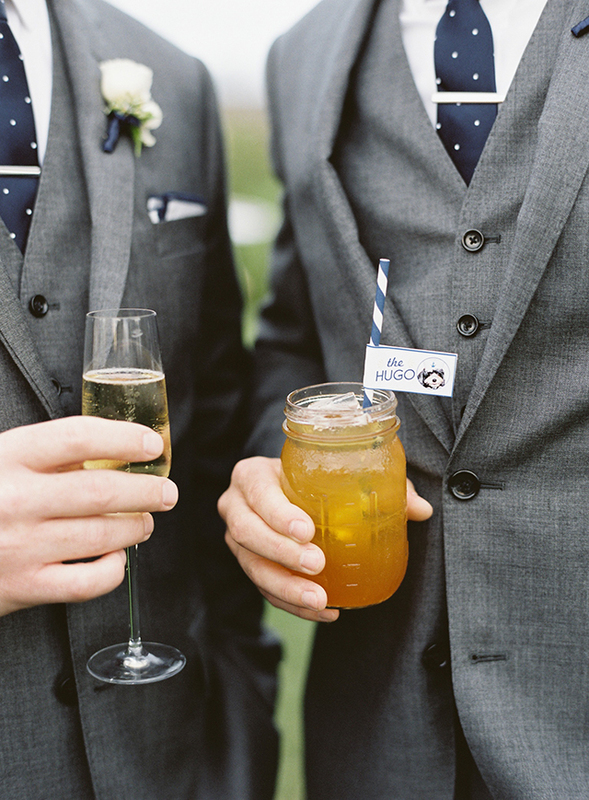 The tags read “to have and to hold and to keep from the cold” and also included the couple’s logo. 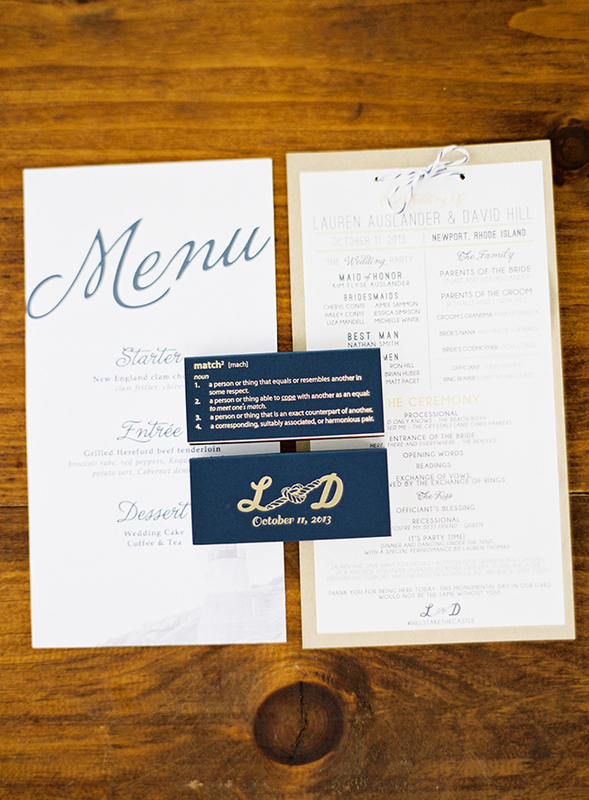 The Reception: Other stationery touches for the wedding reception included table numbers and the menu which both resonated with the invite design, as well as customized match boxes. Thank you Lauren and Dave for bringing me in to be a part of your big day! 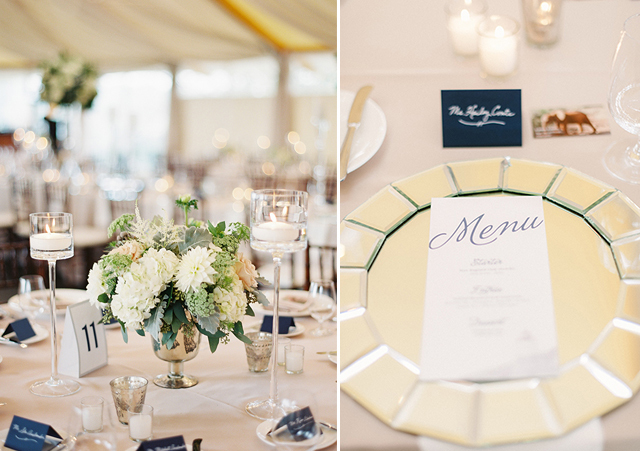 And a big thank you to wedding photographer Judy Pak for all of these incredibly beautiful photos.